EEG Biofeedback Training (often called neurotherapy or neurofeedback) is a learning strategy that enables persons to alter their brain waves by getting a feedback of their present state. 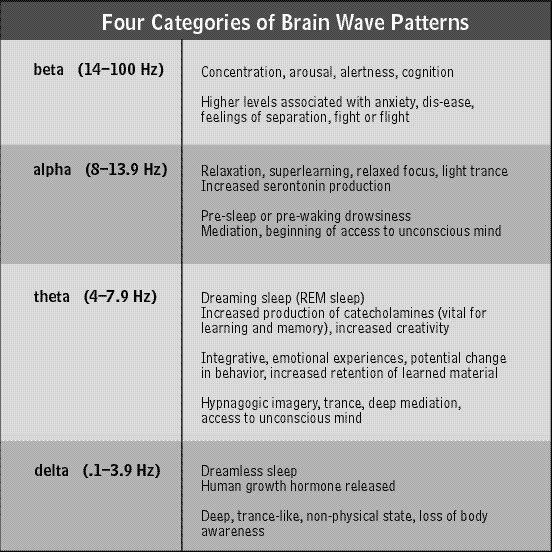 A delta wave is a high amplitude brain wave with a frequency of oscillation between 0.5–4 hertz. Delta waves are usually associated with the deepest stages of sleep (3 and 4 NREM), also known as slow-wave sleep (SWS), and aid in characterizing the depth of sleep. When detected in a subject not asleep, their attention is inwardly focused, relaxed and in some instances deepens when entering into trance states. The theta rhythms frequency range of 4–8 Hz are detected in the frontal lobe are often “Cortical theta rhythms” low-frequency components of scalp EEG, usually recorded from humans. Meditation and breathwork show an increase in this brainwave, and with practice thetawaves dominate a receptive state of mind, lightly relaxed, demonstrated by experience of hypnogogic and hypnopompic states of reverie, either side of sleep onset, and the occasional lucid dream ! Alpha waves are neural oscillations in the frequency range of 8–12 Hz arising from synchronous and coherent (in phase/constructive) electrical activity of thalamic pacemaker cells in humans. They are also called Berger’s wave in memory of the founder of EEG. Alpha waves predominantly originate from the occipital lobe during wakeful relaxation with closed eyes. Alpha waves are reduced with open eyes, drowsiness and sleep. Historically, they were thought to represent the activity of the visual cortex in an idle state. More recent papers have argued that they inhibit areas of the cortex not in use, or alternatively that they play an active role in network coordination and communication. 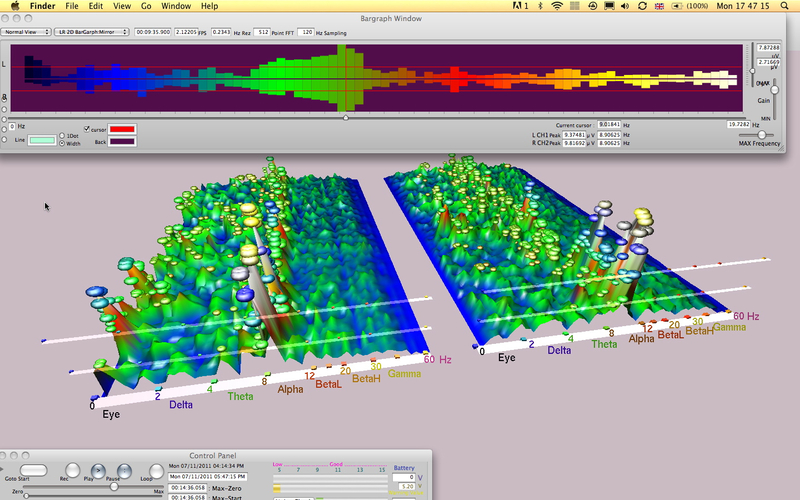 Occipital alpha waves during periods of eyes closed are the strongest EEG brain signals. Beta wave, or beta rhythm, is the term used to designate the frequency range of human brain activity between 12 and 30 Hz (12 to 30 transitions or cycles per second). Beta waves are split into three sections: Low Beta Waves (12.5-16 Hz, “Beta 1 power”); Beta Waves (16.5–20 Hz, “Beta 2 power”); and High Beta Waves (20.5-28 Hz, “Beta 3 power”). Beta states are the states associated with normal waking consciousness. Whether or not gamma wave activity is related to subjective awareness is a very difficult question which cannot be answered with certainty at the present time. Gamma waves are observed as neural synchrony from visual cues in both conscious and subliminal stimuli. This research also sheds light on how neural synchrony may explain stochastic resonance in the nervous system.] They are also implicated in REM sleep, which involves visualizations, and also during anesthesia.